I had some trouble connecting my Android phone to the new Vuze Camera from HumanEyes. I contacted their support department, and they offered some help, but to follow their instructions to connect I would have to reset the WiFi settings every time. 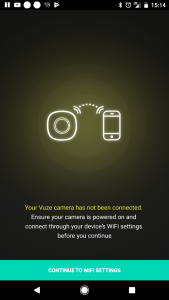 The problem I was having is that even though I would connect my device to the WiFi network that the Vuze Camera created, the software would not be able to connect to display the live feed and access the settings. After playing around some more with the camera, I figured out what’s going on. The software on your device connects through WiFi to the camera. The software likely tries to connect to some preset IP address of the camera. If the device you have doesn’t have a cellular connection, this method of connection works every time with no hassles. 1. The IP address the Vuze software on the phone is trying to access likely gets directed out to the internet… making the Vuze inaccessible to the phone. 2. The subnet that the cellular network DHCP service is supplying the phone makes the Vuse camera IP address not addressable from the phone’s IP address. 2. Enable ONLY Wi-Fi on the phone, and connect to the Vuze network. Vuze software will now reliably connect to the camera every time. I would like to still have cell network connection while connected to the Vuze camera, but I don’t know if this is something that can be fixed in software.